At 60dB, we’re building a platform that brings you news, sports and talk radio for the digital age, creating a unique listening experience — digital radio with stories personalized for each listener. Like traditional radio, which is available everywhere — on your nightstand, in your kitchen, in your car — we want 60dB to be available anywhere you want to listen. Today, we’re happy to share that 60dB is now available as a Skill for your Amazon Alexa device. 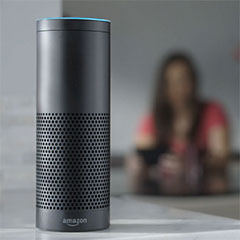 Listeners will have access to their personalized “Quick Hits” feed on their Alexa-enabled devices. Millions of people have an Amazon Echo, Dot or Tap in their home; our skill will bring 60dB to all of those devices. With a listening experience built around short & timely news, sports and entertainment stories from a wide variety of partners, 60dB is the perfect service for the Alexa-enabled speaker in your kitchen, living room or bedroom. People with existing 60dB accounts can get started right away. If you don’t have a 60dB account yet, you can create one on our iOS app or visit us on the web at 60dB.co to create your account. Using the Alexa app on your smartphone or on Amazon’s website, search for the 60dB skill. Enable the 60dB skill and sign-in to your 60dB account. You’re all set! Ask Alexa to “play stories from 60dB” (pronounced “sixty dee-bee”) to hear stories from your “Quick Hits” feed. Now, 60dB listeners can seamlessly transition from listening on their iPhone in the car to their Echo, or other Alexa-enabled device, when they arrive at home. No more missing the rest of the story when you walk in the door. Like our iOS and web apps, the 60dB skill is tailored to each listener’s unique interests. As you listen to (or skip through) stories, 60dB learns more about what you like — or don’t like — and refines your listening experience. We’ll give you more of the stories that matter to you, and fewer of the stories that don’t. In the coming months, we’ll be working hard to improve our skill, so as always please drop us a line at feedback@60db.co to share your thoughts. Thanks to Matt Graves and Rajat Kumar. 60dB brings you today’s best short audio stories. News, sports, business, entertainment, comedy stories & more — personalized for you. Get our iOS app today.